I hope everyone had a wonderful stitchy weekend!! I didn't get to hermit Saturday away like I wished, however I did make progress on both Jane and TBF. Saturday was such a gorgeous day that it was a sin to stay indoors!! I had to be outside soaking in the sun! You never know when we will get it again, so we jump at the chance to soak in the rays...you know to reserve that Vitamin D!! Saturday night, I went to a pre-going away party for two really good friends that are leaving us to go on a cycling adventure in Europe, then live in Montreal for a couple of years. I am happy and sad at the same time for them. I'm already saving up money so I can visit them in Montreal, a city I have always wanted to explore. 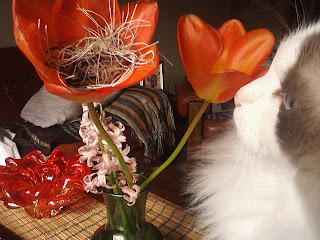 So here are my photos of my TUSAL tulip, yes a tulip! I thought it would be cute to put it in the tulip instead of a jar. There really isn't much in the way of orts seeing as I didn't get a heck of a lot of stitching done this month. Oh that Titus always interested in what I'm doing!! As you can see, not a lot of threads!! While I was writing this post, I got my package from 123stitch.com!! 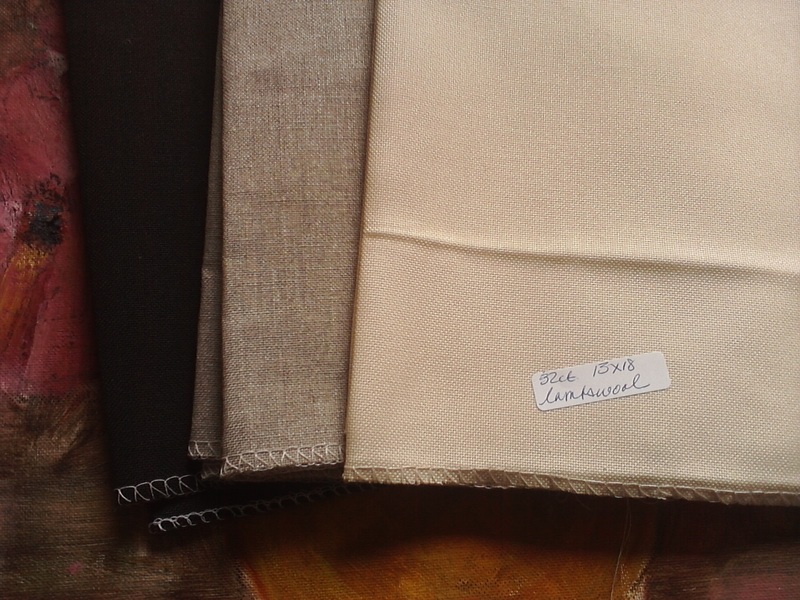 I ordered a couple of new fabrics. One is jobelan, which I have never used before, I am quite excited to try it out. It's very soft!! I also received some black lugana. Never worked with black before! I already have two projects in mind for the black lugana!!! Can't wait to start them!! 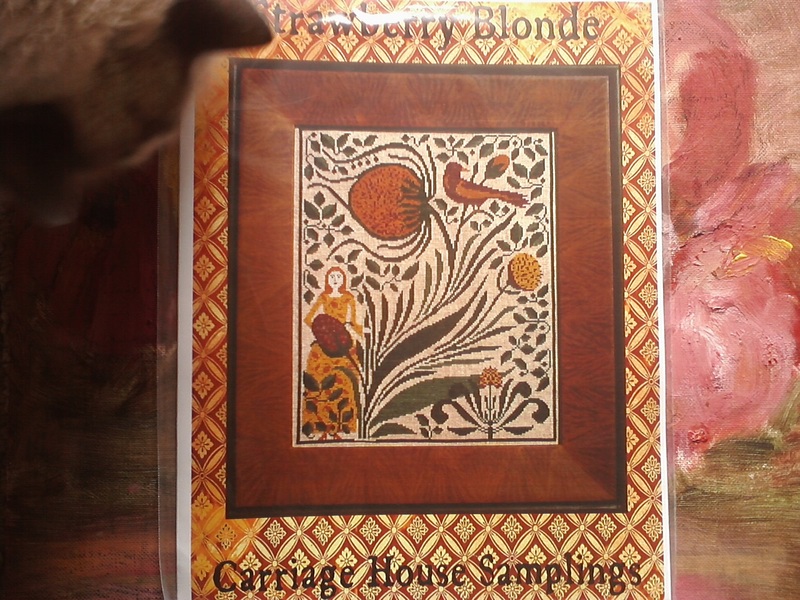 I also ordered this lovely chart from Carriage House Samplings. I love the bird and the swirly flowers!! Not sure when I will start that project, hopefully sometime this year. I really love it! As for the IHSW results, I worked more on Jane than I did on TBF. 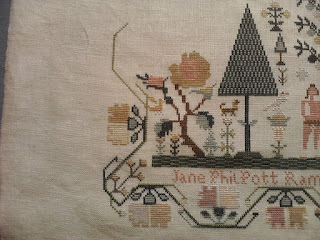 I just loved stitching Jane's motifs, especially the big pink flower on the upper left corner. I worked a bit more on the border and I think I will continue working on the border today. 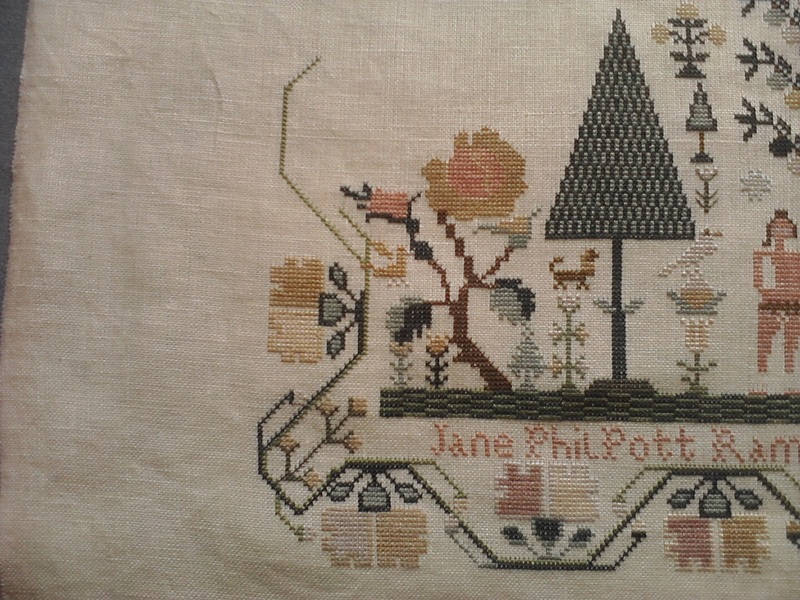 I ironed out Jane for the picture and when I took her out of the Qsnaps, I am rather happy with my progress. She is such a large sampler and I have a lot more to do, but that means I get to extend and savor every moment of stitching her!! Titus showing me how he can do a Yoga stretch. He always does this pose! It's his favourite one!! Well, that's it for now. 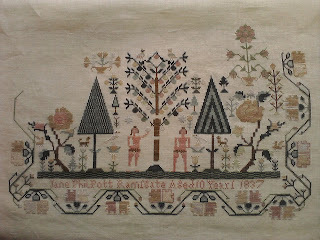 A nice short, stitchy post. I hope to finish a couple of projects this week, stress on the word "hope!" I will be visiting blogs today to check out everyone's TUSAL's and IHSW results!! I almost forgot to mention that I've been thinking of doing a giveaway when I reach 200 followers! I only need two more people to join! Thank you for taking an interest in little ol' me and my blog!! I'm not exactly sure what the giveaway will be, but I have a couple of ideas floating in my mind!! Your Jane is looking wonderful. I love the funky A&E!! 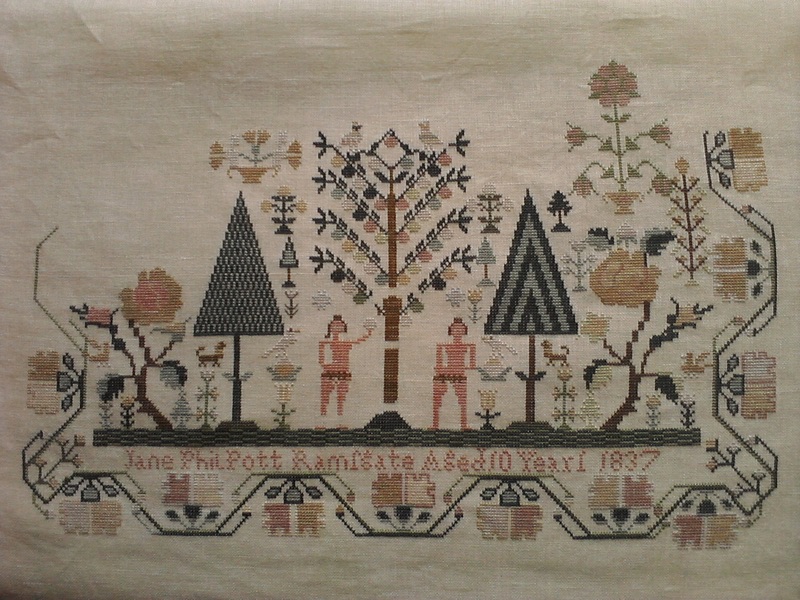 I love your stories and your needlework! Tulsa Tulip - now that's a first! Titus maybe eying the tulip and not the floss! Julius has taken to eating my tulips so I can't have them inside anymore! boo hoo! Your Jane is looking beautiful! First off, Titus is adorable!! Our kitty does the "yoga stretch" all the time! Your ORTS are displayed beautifully, nice idea! 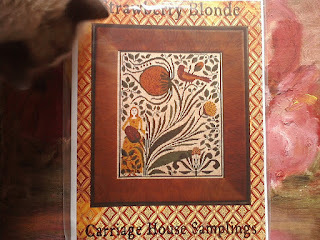 That Carriage House Samplings chart is gorgeous...can't wait to see you start it!! I like every single details of your post very much. Thanks for sharing. How creative to put your ORT in the tulip! Nice purchases. 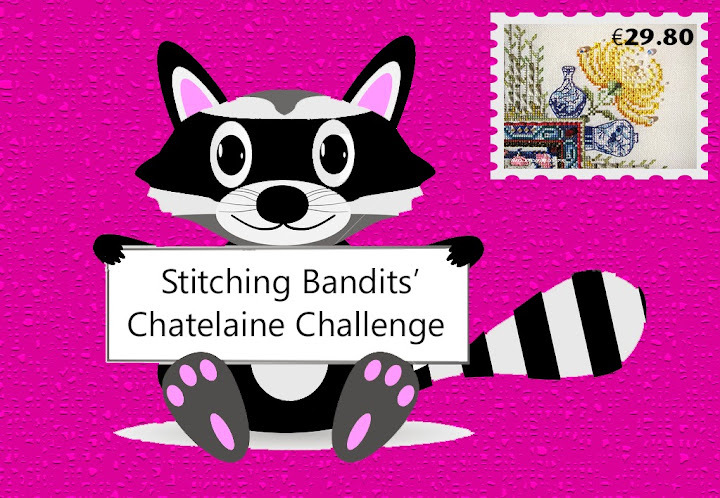 :) Your stitching is beautiful! 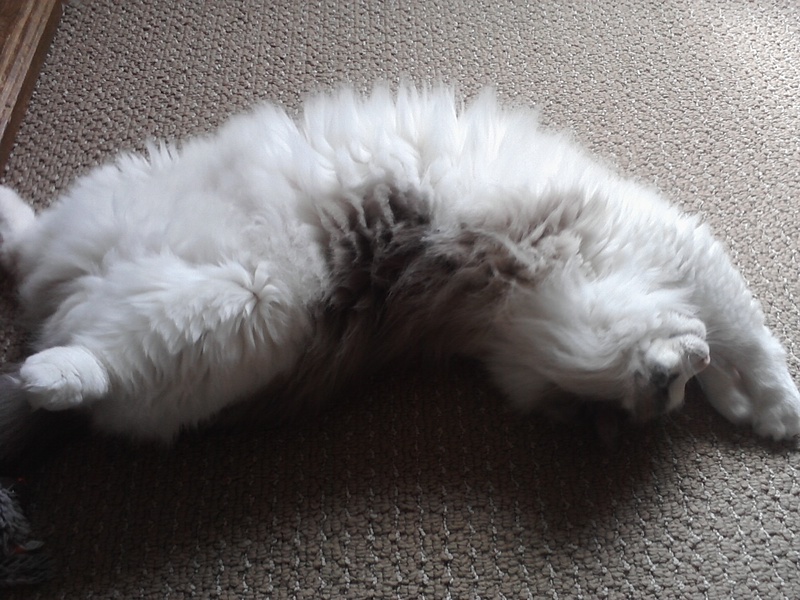 Lovely post - your kitty looks so relaxed and your progress on Jane looks really good. 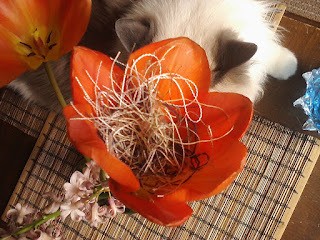 Great photos...stitching and kitties! That Carriage House pattern does look interesting. Have fun with your new fabs. I love your TUSAL tulip. Tulips are one of my favourite flowers. The other one being a rose. Titus is such a ham. Too cute! Jane looks great. Quite a bit of progress since your last update. TBF seems to be moving along well too. Love your TUSAL tulip! And oh my, how gorgeous Titus is! Glad to hear that you got to play in the sunshine some this weekend. What wonderful new stash. I love the new chart. I also love your TUSAL tulip. You are making great progress on Jane. Nice stash and your doing great on Jane. Can you not do some more on the Tea Cup one. ;) Cheeky i know,but i do like that one. I love your threads in the Tulip. 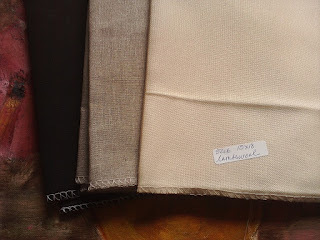 Love your stitching great post. Titus looks adorable posing with your Tulip TUSAL....very original idea too! 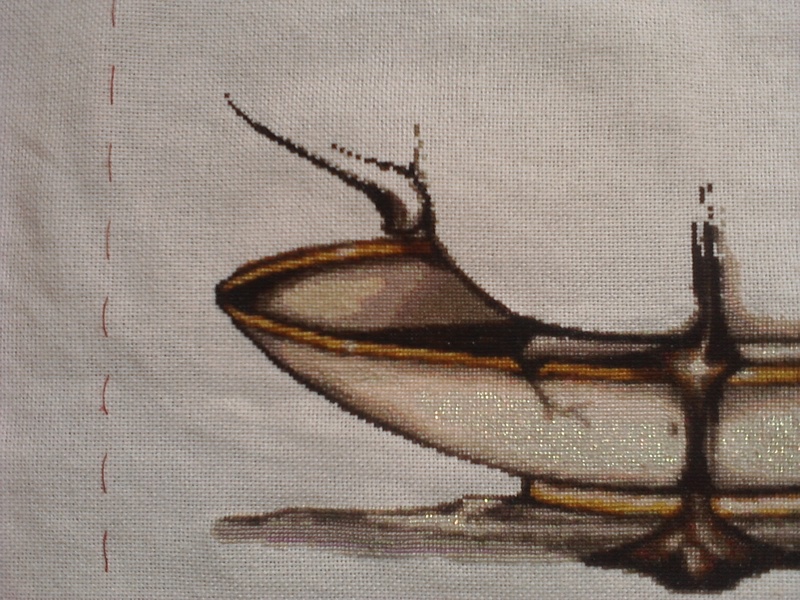 Your progress on Jane is just gorgeous, and I'm so glad that you are savoring every stitching moment on her. Your tulip TUSAL looks great! Love the pic of Titus doing Yoga! I can be expecting a package from 123stitch too, can't wait. I love how you displayed yout TUSAL, very clever idea. Ah, I love the tulip TUSAL!! A very creative way to show your ORTs and great kitty models to help you with this post! Great stitching. I admire your work. Stitching looks great. Cool idea of putting your TUSAL in a tulip. If you make it to Montreal let me know, I don't mind making the 2hr drive from Ottawa to meet up! I love your orts in the tulip ours are up but not out yet! Nice new stash. Those fabrics look lovely. I love your TUSAL Tulip! Your Jane is looking beautiful - what a spectacular piece that will be! I love it! I'd also love to go to Montreal - will do it one of these days (maybe by train)! I will follow as soon as I get home - can't do it from work but I have added you to my blog roll! What a neat idea to use the tulip for your orts! Titus looks impressed too! Your WIP are looking fabulous and I adore all your new stash. I love stitching on Jobelan and another one I love is Jazlyn. Sometimes though the jazlyn is too soft and you get a lot of fuzzies while stitching. Montreal is an amazing city so I do hope you get the chance to visit. I used to go quite frequently when I lived in Cornwall but now the only time I visit is usually on my way to visit my son in Quebec. ANNNIIEEEE! There's the tulip. It's gorgeous... and Titus.... ROFL!!!! OMG, he's too adorable for words. 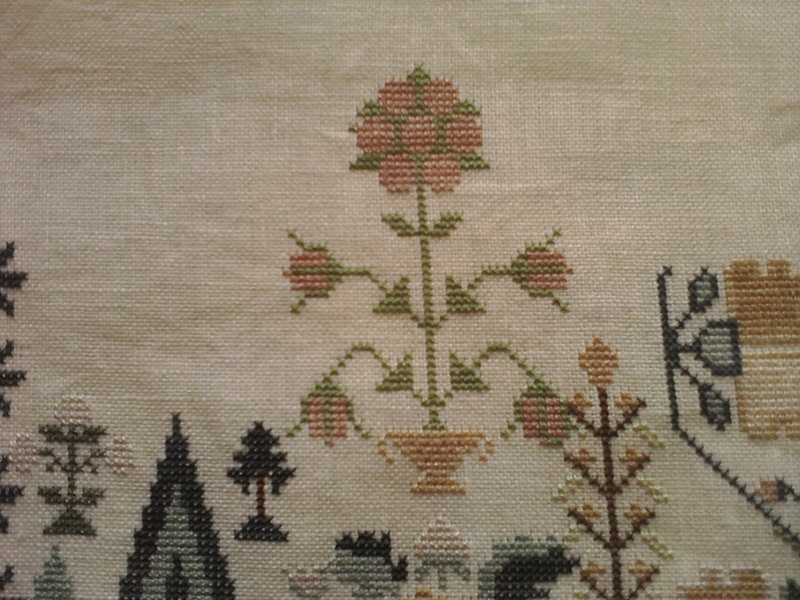 aww very sweet stitching..i love it so much..
Congrats on your progress-- I'm going to have to try and remember that bit about a big project giving me the opportunity to savor lots of time with it, as opposed to swearing at it for taking so long. How very clever of you ~ love your tulip TUSAL!!! Great stitches and Titus is such a cutie ~ looks so soft! How cute is your tulip TUSAL, Anne :) And I love your new stash. I think you'll really enjoy stitching on black. It is one of my favorites for ornament finishes. Not sure about doing a large design on it, having never tried. But, I love how well all the colors show up on it.